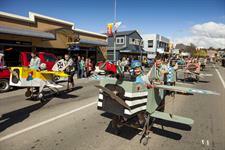 Central Otago is a natural arena for events, offering something for everyone! From motorcycle rally to multisport, horses to history, and festivals for wine, food, blossoms and thyme. Whether participating or just watching, our events have that unique Central difference; where even an event can seem like a holiday! 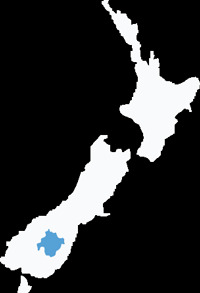 Many of the events held in Central Otago attract national and international support. There are also a number of smaller local events throughout the year. Use the filters below to select a date and an event to interest you. Add an event | If you would like to list an event that is located within the Central Otago District on this calendar please fill out the details on our event listing form. 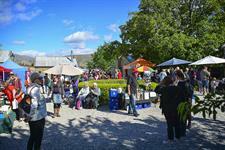 Cromwell Farmers & Craft Market every Sunday from Labour Weekend through Easter. Come shop for local produce, cheese, meat, take away refreshments, and beautiful crafts. Autumn planting Korimako Corner Haehaeata Natural Heritage Trust which operates the Clyde Railhead Community Eco-Nursery invites your help at a planting working bee of locally seed sourced native plants. Bring a shovel and gloves. Morning tea provided. Central Otago’s premium creative fashion event celebrates wool’s incredible qualities as a natural fibre and the ways it can be used creatively in high-fashion garments. There are three parts to the annual event each with their own unique fashion focus. Celebrate the arrival of spring in Alexandra, Central Otago. This is NZ’s longest running festival with its Grand Procession – featuring decorated floats, princesses and a party in Pioneer Park. A new favourite is the Friday night Race Around the Clock and Mardi Gras.